How much wattage power supply (PSU) do you need for your PC? This is a very a common question that is being asked by most of the gamers or PC users. Buying a new power supply for your PC can be a tricky task because you have pick the PSU according to your computer’s power consumption. Power consumption of your computer is measured is Wattage or Watts (W), which is a unit of power. All the power supplies available in the market have their own maximum power capacity (load carrying capacity) or wattage associated with them e.g. 400W, 500W, 600W and so on. The more is their wattage, the higher load they can bear or can provide the rated power to your computer components. Wattage or Watt (W) is one of the most important factors for choosing the power supply because at the end of the day it really comes down to the fact that Is you PSU capable handling your computer load comfortably or not. You should choose your power supply according to the PC power requirements because if you chose an under powered or low wattage PSU then you do face issues like system restarts & instability and it may also cause damage to your components or gets burnt out. On the other hand if you have chosen a much higher wattage PSU then you would be wasting much of your money on it, which you could have saved and invested in some other components. So, choosing a proper wattage PSU is a wise decision and here I am going to list down some of the best power supply calculator tools that will help you predict your computer power consumption in wattage, so that you can buy the right Wattage PSU for it. 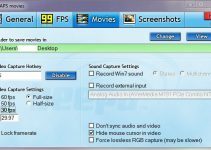 You just have to select the right components that are installed in your computer and then press the calculate button to know the approximate power consumption of your desktop PC. Power Supply Calculator also helps to select the right Uninterruptible Power Supply (UPS) for your PC. These are online PSU calculator tools and are also called power consumption calculator, PC wattage calculator or PC power calculator. Here are the best online power supply calculator tools that can help you to choose the right wattage PSU for your PC whether gaming or a work one. These power supply calculators are updated regularly with new hardware components and are pretty accurate in predicting your PC Wattage and Power Supply Recommendation. To use these PSU Calculators, just select the components that you have installed in your PC case and then hit the calculate button to know your power supply requirements. 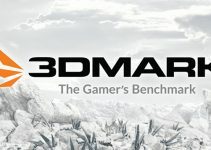 Cooler Master is a reputed computer hardware company that is known for its CPU Coolers, Case Fans, Computer Cases, Power Supplies, Thermal Paste and other PC accessories. 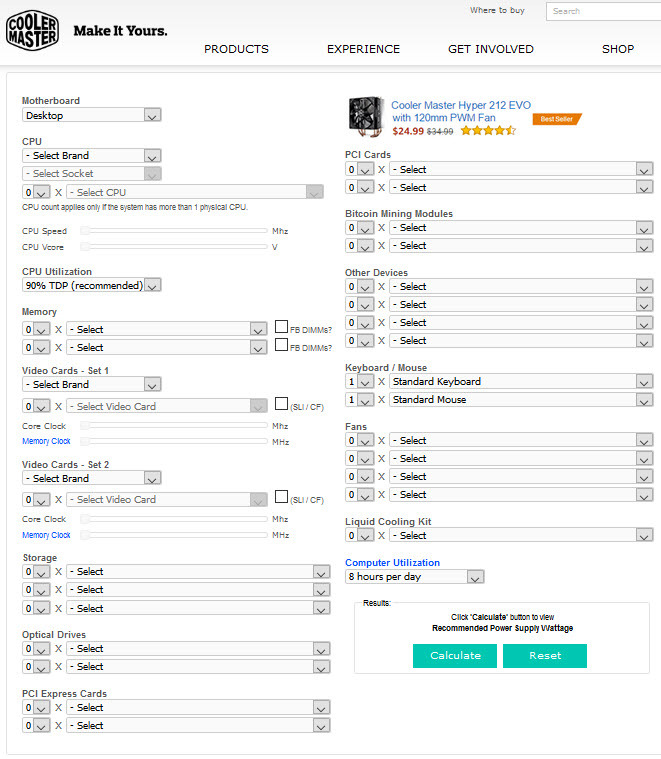 Here we have a power supply calculator from Cooler Master which is a pretty accurate and reliable PSU calculator for recommending the proper wattage PSU for your computer. It tells you both the load wattage and the recommended PSU wattage for your desktop computer, server or mini-ITX or HTPC build. It also has the option that allows you to select Bitcoin Mining Modules if you have installed for cryptocurrency mining. Check out Cooler Master Power Supplies here. This is one of the oldest and most popular power supply calculator tool for selecting the right power supply for your Desktop, Server and Mini-ITX build for HTPC purpose. This is a very accurate power supply calculator and it comes with more options and features than other power supply wattage calculators. It has got two modes of operation for calculating power consumption, basic and expert. The basic mode or version allows you to select minimum sets of components (major parts) to estimate the total power consumption while the expert version allows you to choose various PC parts or components (USB, LED, Controllers, Liquid Cooling etc.) and also adds CPU and Graphics Card Overclocking fields. Other great thing about this power calculator is that it also analyzes the energy cost of your build per year which may come very handy for some users. Highly Recommended by me. A decent power supply calculator from be quiet!, which is known for its silent PC cases, CPU coolers, Fans and Power Supplies. 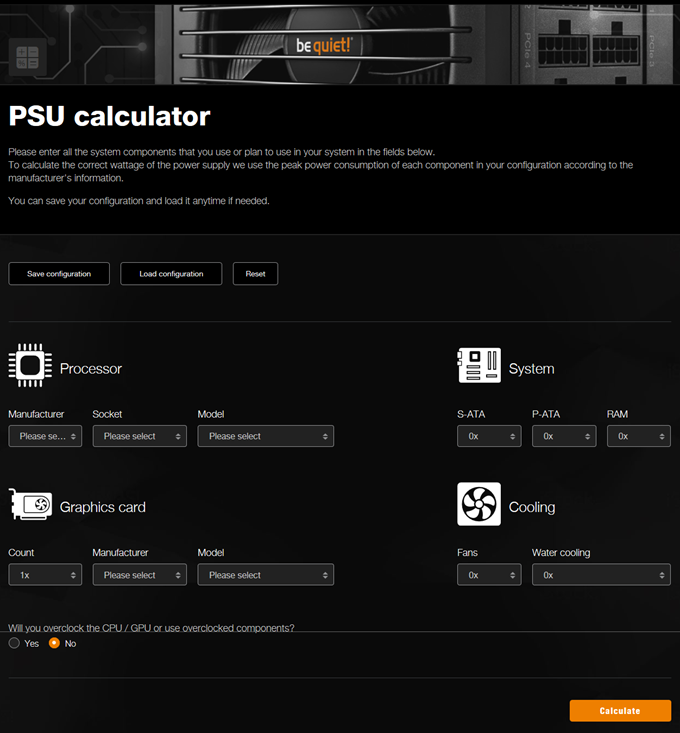 This is a basic PSU calculator tool and has very few components to choose from. Not as accurate as the above mentioned power supply calculator tools but good enough to get an idea about your computer power consumption. A very simple and easy to use PSU Wattage Calculator from Newegg, which is one of the largest online stores for computer hardware and consumer electronics. Well, this power supply calculator does not come with all the selections and it does give a slightly higher PSU recommendation compared to the PSU calculators mentioned above. 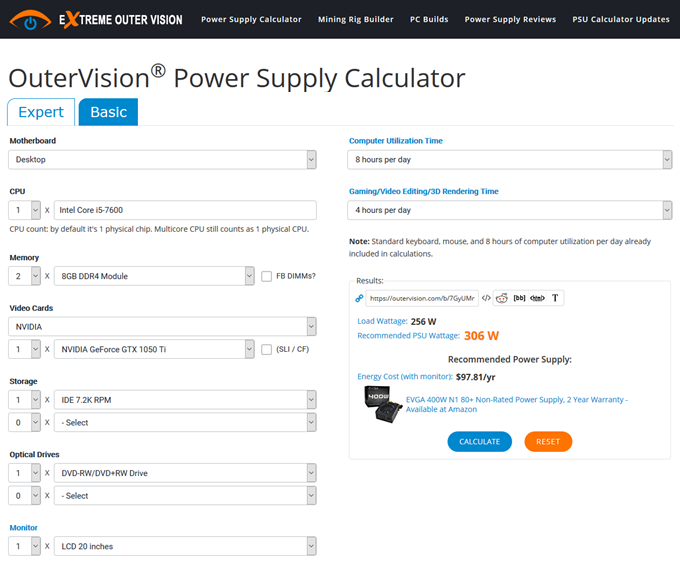 It only gives a general idea so if you want more detailed and accurate results then you should the OuterVision and Cooler Master Power Supply Calculator tools mentioned above. 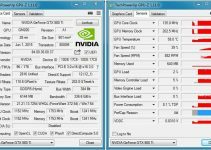 Here are some other online power supply calculator tools that you may try to get more idea about your computer power consumption. How Accurate are these PSU Calculators? 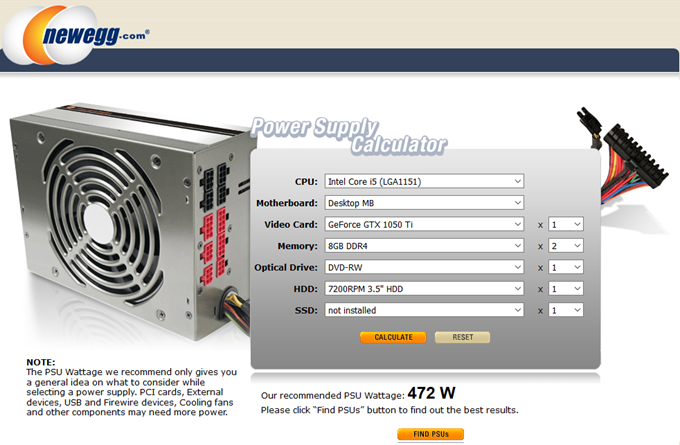 These best power supply calculator tools are pretty accurate in predicting your PC power requirements or consumption. But my general advice is to get a +100W higher power supply over the recommended PSU suggested by these PSU calculators. This will also future proof your PC if you want to upgrade to a higher graphics card or install more components in future for gaming or other purpose. Wattage is generally the most preferred criteria when choosing a PSU for your computer. But there is even more important thing than Wattage, that you must keep in mind when choosing a PSU, which is the amount of current present on the 12V Rail. This is because it is the one that supply power to all the most important components of your computer that includes your motherboard, processor, graphics card, case fans, hard drives. So, having a good amount of current on your 12V rail is very important. 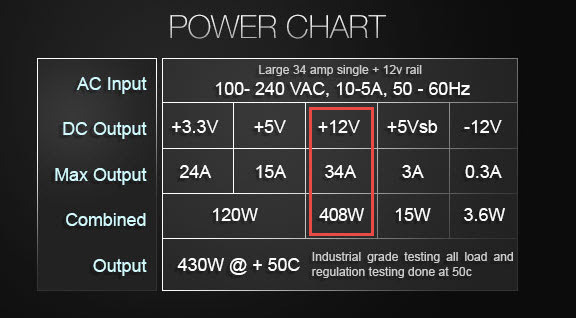 For a 400W PSU it should be 30A, 40A for 500W PSU and so on. Cheap and unbranded power supplies generally have lower amount of current on 12V rail, so you should avoid them completely. Here are some other important things that you should keep in mind when choosing a power supply for your gaming PC or desktop. 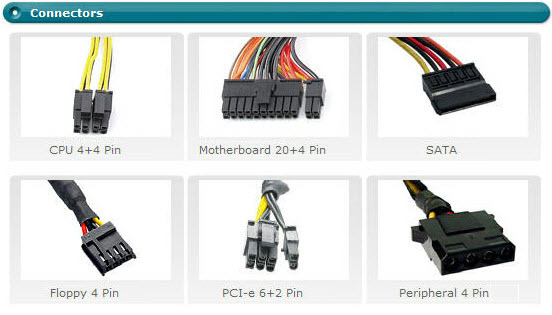 If you are building a gaming PC then you must get a power supply with 6-pin / 8-pin PCI-Express power connectors because good mid-range and high-end graphics cards are quite power hungry and they require external power from the PSU in form of 6-pin/8-pin PCIe connectors. So, check this out before buying a new power supply for your gaming PC. If your PSU comes with 80 Plus Certification rating then it will draw lesser power, which means lower electricity bill for you. 80 Plus Certification rating depicts how power efficient your PSU is at various loads. The various 80 Plus certification ratings in decreasing order for power supply are 80 Plus Titanium, 80 Plus Platinum, 80 Plus Gold, 80 Plus Silver, 80 Plus Bronze and 80 Plus White. Power supplies with higher 80 Plus ratings are expensive than the ones with lower rating or without it. Always buy a branded power supply because they are reliable, delivers accurate output, has good build quality and comes with better warranty. A cheap unbranded PSU should always be avoided as it can cause lots if system instability issues, restarts, get burnt or may cause damage to your precious and expensive PC components. Some of the good brands of power supplies are Seasonic, Antec, Tagan, Cooler Master, EVGA, Corsair, Thermaltake. How to check my power supply specs? These online power supply calculators are really worth the try and can really help you to estimate the power consumption of your desktop and choosing a right power supply. Yes, there are other factors involved too when calculating the power requirements but still they are very helpful in predicting the approximate wattage of your PC and recommending the PSU for it. If you still have doubts on which PSU to get for your PC then you can ask here by listing your complete PC specs with your budget for the power supply unit.